Based on the method by Küchle (Math Z 218(4), 563–575, 1995), we give a procedure to list up all complete intersection Calabi–Yau manifolds with respect to direct sums of irreducible homogeneous vector bundles on Grassmannians for each dimension. In particular, we give a classification of such Calabi–Yau 3-folds and determine their topological invariants. We also give alternative descriptions for some of them. The authors thank Professor Shinobu Hosono and Doctor Fumihiko Sanda for valuable discussions at weekly seminars and for various useful comments. 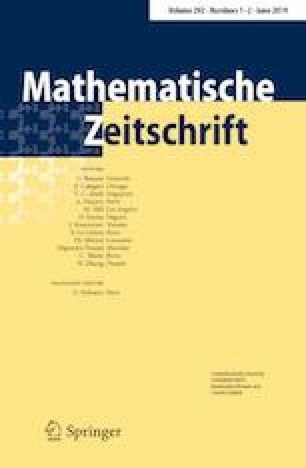 The authors also thank the anonymous referees for providing a number of valuable comments and suggesting to simplify the arguments on the alternative description of No. 15, 17 and 18 in Section 6. A. I. was supported by the Grant-in-Aid for JSPS fellows, No. 26–1881. A part of this work was done when M. M. was supported by Frontiers of Mathematical Sciences and Physics at University of Tokyo. M. M. was also supported by Korea Institute for Advanced Study.